A Gentleman's Domain: My Travels. For the benefit of anyone who has been living in a particularly isolated cave these last couple of weeks, and presumably had a very circumscribed Xmas, on 25th December a young nutter tried to blow up an airliner as it was coming in to land at Detroit, with explosives strapped to his upper thigh, inside his underpants, and he would have succeeded had his detonator not failed to work properly and he hadn’t been overpowered by several of his fellow passengers. If what we read in the papers is correct, President Obama lost his temper, which he is reportedly slow to do in normal circumstances, when he learned the details of this man’s flight. The terrorist bought a one-way ticket from Lagos, Nigeria to Detroit, paying cash at a travel agency in Ghana, and he had no checked luggage with him. His name was apparently on a watch list and had been refused a visa to enter the UK before he even applied for a visa to enter the USA. Obama talked about a failure to join up the dots, though I expect that his language was more basic, and less printable, when he spoke the government functionaries responsible for failing to spot the risk this man posed. Showing both frankness and a breathtaking lack of tact, Gordon Brown has stated that the British intelligence services warned their American counterparts about this person before he even booked a ticket. Heads will have to roll to satisfy an understandably angry public and my guess is that one or two mid-level functionaries at the Dept. of Homeland Security will be publicly fired – possibly the one who gave the terrorist a US entry visa. Visa or no, the terrorist is in the USA now, and will probably be spending a great many years here, though I suspect that he won’t be able to do very much sightseeing. So how does all this affect the rest of us? Well, as usual whenever there is a terrorist incident, successful or foiled, those responsible for security at airports go into panic mode, increasing all existing security measures and adding a few more for good measure. All of which succeed in making flying a more and more miserable experience. I remember when going on a trip that involved flying was something exciting. Now it is just something to be endured. My wife and I flew back home from England to our home in Florida last Monday. In normal circumstances it would have been a tiring day, with no fewer than three flights in store for us, but the extra measures made it all pretty miserable. We flew from London to Washington/Dulles, then Dulles to Charlotte, NC, and then from Charlotte to our home town, and I have to say that the actual flights weren’t that bad, considering. I’m 6’2” and airplane seats in economy are not made for people my height, but as long as I get an aisle seat I can make myself reasonably comfortable. I’m used to that. There were a couple of screaming babies on the flight from London but you have to put up with that when flying economy (economy is a relative term here – our tickets were pretty damn expensive). The second and third flights of our trip were on small commuter jets, which appear more cramped that transatlantic jetliners, but the flights were about an hour each, so that doesn’t really matter much. No, what was utterly miserable, and what made the trip seem endless and frayed our tempers and took all the joy out of returning home was the constant standing in line. Lines, I should say. Long, slow moving lines, snaking back and forth along roped-in lanes. We stood in no fewer than five of those, and because according to my calculations we spent a total of almost four hours standing in line, I propose to describe all of them. One of the panic measures that the airlines instituted after the Xmas Day incident was to restrict hand luggage. When we had flown west to east in early December the rule had been one item of hand luggage plus one personal item, e.g. a laptop. Now all of a sudden it was one item, period. Now we neither of us were about to put our laptops in out checked baggage, so we had to consolidate our packing, and put only essentials in out laptop bags in the extra zippered pockets that you normally use for flash drives, mice and other laptop extras. That meant we were compelled to put some items in our checked bags that we would have preferred not to (cameras, medications etc). This new measure, by the way, was only for flights from London to US destinations, not for everyone. Anyway, we fetched up at Heathrow airport at 8.30am, having spent the night in an airport hotel, ready to check in for our midday flight. We wanted to get check-in and security over with as quickly as possible, so we could take things easy in the departure lounge, have breakfast etc. Ha! Check-in took close to an hour. It was in two stages. First we had to line up to use an automated check-in machine, a touch screen which also scanned our passports and my green card, then burped out boarding cards for both of us for all three flights. I was rather impressed at that – nice and speedy. And a fat lot of good the speediness did us, for we then had to get into another line to have our baggage – four cases – checked. That line took well over 45 minutes. At one point the line seemed to have stopped moving altogether. I know there were passengers for at least three United flights in that line (San Francisco, Chicago and Washington) – in other words three jumbo jets’ worth of people – being served by six check-in staff. After a while they opened up a couple more desks. We bid a temporary farewell to our bags and went off to make our way onto the departure lounge via the security check area. This was the security run by the BAA (British Airports Authority, who actually own and run the airport). To my surprise, it was fairly quick and even though it was very thorough we were though it in about twenty minutes. As I stood there on the other side, taking my belongings out of the plastic trays and putting my shoes and belt back on, I sighed with relief that that was all over. With smiles on our faces, we strolled over to one of the many restaurants in the Terminal One departure lounge and had a leisurely and enjoyable breakfast. Then, in line with what the woman who checked our bags had told us, we made our way to the departure gate at about ten-thirty; an hour an a half before the plane was scheduled to take off. And it was here that we were confronted with another long, slow moving line. United Airlines had decided that in addition to the airport security they were going to have their own. I suppose that would have been fine if they had run it differently, but as it was, they had four security staff dealing with the First Class and Business passengers, while we peasants in Economy were dealt with by five security staff. Five people to check about 200 passengers. No wonder the line crawled forward so slowly that at times it seemed that it wasn’t even moving at all. It took about 50 minutes for us to be seen. Each passenger was directed to a small table where he had to empty is pockets and his hand baggage was searched by hand. The unsmiling woman who dealt with me even riffled through the pages of the paperback book I was carrying – no doubt to see if I had any wafer-thin dynamite sticks in it. Then I was patted down by a male security agent – a very incompetent search really. I was taught in my police days how to do a so called pat-down search, and patting doesn’t enter into it at all. The end result was a lot of disgruntled passengers in a hot, sealed-off departure area where for whatever reason even the drinks machines had been turned off. We took off 40 minutes late but somehow were able to make it to Washington/Dulles on time. As I say, the flight wasn’t all that bad – just long and boring, as transatlantic flights usually are. I didn’t watch any of the films on offer. I was more entertained by the moving map. It took just over four hours to cross the Atlantic, but since we made landfall over Newfoundland, It took another three hours to head due south to Washington. We landed at Dulles airport a few minutes ahead of schedule. Never again will we take a flight that arrives at Dulles! Once we had got off the plane, we followed the signs for transfer passengers. I reckon at least half the passengers on our plane were taking onward flights, not to mention passengers from several other planes that arrived round about the time ours did. The result was a huge, and I do mean huge, crowd at Immigration. Approximately half of them were foreign visitors, and the other half were US citizens or permanent residents. There was a line for each category. So, straight away we found ourselves in a long queue, between ropes, shuffling first one way across the hall and then the other. This was the worst one so far. What annoyed me was that there were five positions closed that I could see. You’d think that they’d manage to find an officer to man every desk in the hall at what was obviously a peak period. I think it took us an hour to get to an Immigration officer’s desk. A few minutes and a couple of rubber stamps later we made our way to the baggage claim area. As you can imagine, it was very crowded. The carousel assigned to out flight was also assigned to flights from Geneva, Vienna, Tokyo and Berlin that had recently landed so there was a huge throng milling about, everyone getting in each other’s way. Also, to my surprise, there were long lines of unattended suitcases across the floor, as though forlornly waiting for their owners to come and collect them. Our bags arrived after about 20 minutes and we put them on a trolley and trundled over to the Customs inspectors. At least this line didn’t take more than a few minutes. When we got to the front, the inspector seemed almost indifferent. “You bringing in any food?” “Yes, some candy and about two thousand tea bags.” “Ok, good enough.” He waved us through and we re-checked in our bags for the next two flights. Now, I thought, we just need to find out which gate our connecting flight is leaving from and then we can relax for a bit. Wrong!! At the end of the customs hall there was a crowd of people. I couldn’t think why there would be at first and then I realized that we were about to be security checked yet again. We were still airside, mind you, and still “sterile” from the previous security check at Heathrow. I have no idea why they needed to check us all again, but they did. This security check had the appearance of something that has been hastily put together. It wasn’t in a special hall or wide area, but had been located at a place where the corridor turned at a right angle, and everything was very cramped and bustling. There were just four lanes, and with hundreds of passengers to be screened there was a bottleneck. This line moved the slowest of all. We waited almost an hour to get to a screener and then went though the familiar ritual: laptops out of bags, pockets emptied, belts and shoes off, walk through the metal detector, recover all the plastic bins with your property in them, try to put your belt and shoes back on and replace your laptop in its bag, all the while other passengers are crowding behind you and trying to grab their property too and everyone is getting very irritated with everyone else while officious TSA people are shouting something about keeping the lines moving. When we were finally through there, we were able to take a shuttle to another part of Dulles airport, catch our flight to Charlotte, where the gods did actually smile upon us because our connecting flight left from a gate just a few yards from the one where we arrived. No frantic hustle from one end of the airport to another. There was one more wait, at our final destination, where it took about thirty minutes for our baggage to be loaded onto the carousel, but our local airport is almost a one man and his dog operation, so we weren’t too surprised and anyway we were too tired to get worked up about it. One great advantage of flying from the regional airport right here in town – our front door is just a ten minute taxi ride from the terminal. Now, I know some people have suggested that profiling of passengers would be a very good idea and others have recoiled in horror at the suggestion of such blatant discrimination. I am not sure what the answer is, but I am almost 100% certain that we can assume that a mother, father and three young children, such as the family immediately ahead if us at the security check, present a threat to no one. If we look back at all the terrorist incidents of, say, the last ten years, we can’t help noticing that the number of outrages perpetrated by young children was, at my reckoning, zero. I think the same applies to grandmothers in their seventies, among others. Of all the lines we stood in, all those hours we spent moving forward a foot or two at a time, three were far more miserable than they should have been because of the incompetence of the people organising them – United Airlines’s extra security at Heathrow, where there weren’t enough screeners: Immigration at Dulles, where they didn’t have enough people on duty to cope with the volume of passengers: the Dulles post-customs security check that was an overcrowded shambles. I don’t want to belabour the point but lets have a bit of common sense about airline security. It need not be as downright horrible as it has become. Meanwhile I leave you with a memory from a more innocent age, when flying away somewhere was still exciting and even romantic. Here we are in England. Chilly, and a bit brisk, and perfect weather for bracing country walks, followed by tea and toast when we return to the warmth of my mother’s kitchen. Next week we will go to town (London). Last year we came over in late spring. Fewer thick clothes to pack. Some of you, my faithful readers, may remember the fun and games we had with missed connections, long stays in unexpected airports, nights in hotels at the airline’s expense and a cumulative delay for over twenty-four hours. For those of you who missed it, the full story is right here. Anyway, we crossed the Atlantic again last Thursday night and this time, with three connecting flights, everything went like clockwork. No late flights, no missed connections, not even any dashes through airport terminals to catch planes at the last minute. We got to Heathrow on time, collected our rental car and were on our way. Everything went well for us. Not for our luggage though. Two of our three checked cases kept us company all the way to London, and they appeared on the carousel after we had been waiting only a few minutes. Then we waited for the third. It was one of those black rectangles with wheels and a telescopic handle. There were dozens of them on the moving belt, but none was ours. I had taken he precaution of putting a blue and grey luggage strap round it to make it easy to spot among all the others. However, it wasn’t there to spot. We waited hopefully until there were just a few bags left, going round and round, and maybe half a dozen passengers. I had never had a bag lost before, in over two hundred journeys by commercial airlines. I was rather starting to think that it would never happen to me – only to other people. Serve me right! Anyway, I went to the United Airlines baggage desk, which I couldn’t help noticing was very busy, and told one of the clerks that one of our bags was missing. He took the baggage claim tag for the missing bag, scanned it under his barcode reader and tapped a few details into his computer. Then he was able to tell me that the bag had been located in Washington airport and would be sent over on the next flight and delivered to where we would be staying. United Airlines were as good as their word, and a man in a white van showed up the following afternoon with the bag. I was grateful, of course, but the thought uppermost in my mind after the whole thing was: barcodes are amazing things! Well, we're in England, and jolly nice it is too. Spring is such a beautiful season here, and the Cotswold countryside looks glorious. We're going to do all sorts of lovely things later today, like go for a long walk etc. But, that's not why I'm speaking to you now. I want to tell you about the comedy of errors (though I saw, and still see, very little about it that is comic) that was our journey from northern Florida to Heathrow airport. It was all very straightforward. I made the booking online last February, three months in advance. To avoid the overland trip to Orlando and the zoo that is Orlando airport, we decided to fly out of Jacksonville, which is much closer, and connect to a London bound flight from an international airport, in this case Miami. So very simple. A one-hour hop down to Miami and a connection to a transatlantic flight from the same terminal. Couldn’t be easier. Leave home to get to Jacksonville at around noon and arrive in London the following morning. Like all overnight transatlantic flights, it would have been tiring but not at all difficult. I’ve done it at least forty times in my life so far and it has always been a doddle. I have to say that the part of the journey that was in my control went off flawlessly. There is no bus or shuttle service to Jacksonville Airport from the town I live in, so we decided to rent a car for a one way drive. Traffic was light and apart from a brief hold-up in Starke (just a few minutes really) getting to the airport went very smoothly. We dropped the car off, unloaded our bags onto a trolley ($3.00 to rent a trolley for a few minutes. Someone’s onto a good thing there!) and trundled off to the check-in desks. Now, it is not my intention to cause embarrassment to anyone, no matter how crappy their service is, so I shall disguise the name of the carrier we were booked with in order to spare their blushes, and I shall simply say that we got to the check-in desk for Zamerican Airlines. It was not crowded but the few people who were there managed to make it seem far more chaotic that it need have been. For some reason, Zamerican have mixed up the self-service check-in desks with the manned ones, and people like me, who prefer to deal with a human being, were jostling with seasoned travellers who wanted just to swipe their credit cards and check in via a machine. Shuffling forward a few inches at a time, we did manage to reach the check-in and after receiving our boarding cards we handed over our 3 checked bags, expecting to be reunited with them in about 10 hours time. Such sweet naiveté! Jacksonville International Airport (JAX) is one of those mid-range airports. Not big on the JFK-Heathrow-Schiphol scale but not exactly a shack either. There was enough to occupy our minds, and a Chilis to get something to eat, between going through security (very thorough but fairly quick) and arriving at our departure gate. Once there, we thought we would have a wait of about 45 minutes before boarding our quick-hop flight down to Miami. Ha! For whatever reason, the airport people have decided that if you want to wait for a plane in their departure lounges, you need to spend the time becoming better informed. So they have decreed that as you sit and wait for your flight you must be bombarded by CNN -- not just on TV monitors attached at intervals to the walls, but also blaring out of loudspeakers set into the ceiling, loud enough to make them impossible to ignore. For those who would rather sit and read to pass the time, it is an intolerable intrusion. It also makes it hard to hear flight announcements. So, instead of reading my book I had to sit and listen to endless chatter (with much repetition, as is the nature all-news TV channels) about Hillary and Obama. All very important, I’m sure, but not what I was in the mood to listen to just then. When they took my booking, and my money, way back in February, Zamerican Airlines had obviously decided that a 55 minute window to change planes in Miami was enough. And if the first flight had been on time, it would have been. However, after we had been sitting in CNN hell for about half an hour, a technician in overalls appeared behind the desk by the gate and stuck a sign up saying that the flight was delayed by half an hour. There was no one at the desk, so I immediately went to another desk, by another gate, and told the woman there that my wife and I were going to miss our connection and that we wanted to know what Zamerican were going to do about it. She already had in her possession a computer print-out of all the passengers on the JAX-Miami flight who were trying to make connections (almost all of us, in fact) and she said that she would rebook my wife and me on a British Airways flight leaving Miami an hour after our original connection. Yes, she assured me, our bags would be automatically rerouted. I’m glad I got out of my seat and went to the desk when I did, because by this time a long queue of disgruntled wannabe connection makers had formed behind me. Anyway, she slowly and painstakingly entered our information into he computer and printed out travel vouchers for the BA flight. I thanked her and resumed my seat. All along, the board by our departure gate said that we’d be leaving at the new time of 6.15pm. But 6.15pm rolled round and they hadn’t even started boarding us. In fact, I don’t even think the plane had arrived. At 6.40pm they began the boarding process and the little ATR-7 (90 seats and 2 propellers) filled with anxious passengers. Then we sat on the ground for over half an hour before they closed the doors, and another twenty minutes before they started the motors and pulled back from the terminal. We finally took off over 90 minutes later than the scheduled time. That meant we had missed two connections. I assumed that Zamerican would book us onto a later flight. Once we got inside the terminal I rounded on the Zamerican passenger agent by the gate and told her what had happened, and that we now required another booking on a flight to London Heathrow. Gatwick was not acceptable. She clacked away at her terminal and told me that the next fight to Heathrow was not until ten o’clock the following morning. Out of Chicago. There are times when all you can do is nod and say ok. Getting annoyed would have achieved nothing. There was another woman from the JAX flight who was being booked onto a BA flight a little later that evening, but she was flying first class, and there were plenty of seats there. I said that after all that Zamerican had put us through we deserved an upgrade but that was airily dismissed. So we got a hotel voucher, a meal voucher, and were told where to catch the courtesy bus to a hotel hard by the airport. The bus actually showed up in a matter of a few minutes and the hotel was almost within sight of the terminal, so we soon found ourselves in the lobby of a very nice hotel. Well, that can’t be bad, you may be thinking. A night in a good hotel, paid for by Zamerican Airlines. And in other circumstances you might have been right. The thing is, though, that our Chicago to London flight was scheduled to leave at 10.00am and in order to catch it we had to fly to Chicago from Miami at 6.30am. That meant check in no later than 4.30am. And that meant asking the hotel reception for a wake-up call at 3.30am. We had something to eat in the hotel dining room (which was full of passengers from the late JAX flight, all waiting for connections the following day) and went to bed, knowing we had scarcely four hours before we had to get up. And you know what it is like when you tell yourself that you had better go to sleep soon because you have to be up early. No matter how tired you are, your body decides to be awkward and rebellious and sleep is a long time coming. We did manage to fall asleep, though, and were jangled awake at 3.30am on the dot and got dressed in the previous day’s clothes (our bags were somewhere in the airport, waiting to be loaded onto the Chicago flight). No time for breakfast. We got the 4.00am shuttle bus to the airport and decided to check in and go through security, and then worry about getting something to eat. An airport at 4.00am is almost empty, as you would imagine. There were people about, but not many. Most of the concessions were still closed, and although the whole place was lit up, there were hardly any check-in desks open. The Zamerican Airlines desks were all unmanned except one in the first class check in, and one in the economy check-in area, where a small queue had started to form. We joined it, only to be shooed away by some official type who told us that that line was only for check-in for a flight to Haiti. So we shifted to the first-class line. The agent in charge there had left the desk but as we stood there she returned to her position and as she passed us I told he we weren’t first class but didn’t know where to check in. She told us not to worry, she would check us in. There was one passenger ahead of us and no one behind us, so it was not as though the first class check-in was crowded. All well and good, until a woman in a maroon jacket with the Zamerican insignia on it tried to order us out of the line, telling us to go check in “over there” as she gestured vaguely to another part of the terminal. We didn’t move, and I told her that the first class woman had agreed to deal with us. She seemed a bit put out at that, but left us alone -- no doubt hoping that we wouldn’t contaminate any first class passengers with our economy class presence. The first class lady checked us in to Chicago and also gave us boarding cards and seat assignments for the Chicago to London flight. So at 4.15am we were free to go through security and wait for our flight. The trouble was, though, the security did not open until 5.00am, so we had to stand in a line of tired passengers, waiting for the security gate to open up. The airport Starbucks was open, though, so we were able to sip something as we stood in line. At 5.00am the security people showed up and we went through -- again, it was thorough but fairly quick. From there we went to our departure gate (CNN at Miami airport too, whether you want it or not), and waited for our flight. We had a 55 minute window between our arrival time in Chicago and the scheduled departure time to London, so I was anxious that we should take off on time -- which we did. The flight up to Chicago was smooth and comfortable and actually arrived a few minutes earlier than scheduled. All we had to do was get to the departure gate for our London flight. As soon as we were inside the terminal I asked the Zamerican gate agent “Where does flight 90 to Heathrow leave from?” at which she turned to her computer screen and told me it was at K-12, which was just half a dozen gates away. No need to go to a different part of the terminal. Yay! We walked quickly up to K-12, with plenty of time left before the London flight departed. There was K-12, and there was a crowd of people sitting around. Strange -- there were no airline agents at the desk by the gate. I glanced up at a monitor showing arrivals and departures and saw the following: “Flight 90 to Heathrow -- canceled” For some reason, I was not all that surprised. There were no Zamerican personnel in sight, but there was a sign telling me where the rebooking center was, and we walked over to it, only to find it unmanned. There was one red telephone on the desk which was a direct line to the Zamerican booking department, so I picked it up and explained to the woman at the other end what had happened and how the two of us came to be in O’Hare Airport with tickets for a flight that no longer existed. She offered me a choice: either a flight to Boston that afternoon to catch a connection to London later that evening, or else a flight to London from Chicago a couple of hours later than that. “No more connections!” I said, “We’ll take the flight from here.” So she booked us on that. We had the booking, but no tickets, so we had to go into the main concourse and get an agent to issue them to us. She did so, and after I asked her she gave us meal vouchers for our enforced stay in O’Hare airport (almost ten hours). Now, as airports go, O’Hare is not too bad to have to hang around in. It may be the busiest airport in the world, but it doesn’t give that appearance. Since we had gone to the main concourse to get our tickets, we had to go back through security again (the third time) but once through it we found that there were places to eat (we had a very nice lunch) and quiet areas to go sit and read. There was no enforced CNN, and several bookstores to look round. The long wait seemed like a long wait, but it could have been a lot worse. Our flight to London boarded on time, but once we had pulled back from the terminal we found that there were going to be delays. There were several flights ahead of us waiting to take off and because of the weather (it was pouring with rain) they were going to make us all wait until several incoming flights had landed. The captain came over the public address system and told us all this, and also said that he was going to shut down one of the engines in order to save fuel. We sat waiting to take off for well over an hour before we were finally off the ground. From then on, I’m pleased to report, everything went smoothly. We landed at Heathrow 7½ hours later, went quickly and painlessly through Immigration and Customs. We waited about two minutes for our bags, the rental car I had pre-booked was ready and waiting and two hours after landing we fetched up at my parents' house, our final destination, a mere twenty-four hours behind schedule, and everything has gone well since then. Our return trip is to JAX via Chicago, with a 4 hour stop-over, and I hope Zamerican Airlines will manage to get us from A to B without incident. If they don’t, I shall report back to you. Some years ago I was able to take a trip round the world, stopping off in about a dozen countries. One of them was Taiwan, where I had never been before and in all probability will not go to again. I didn’t venture outside the capital, Taipei, which I liked very much. Among the many photographs I took was this one. 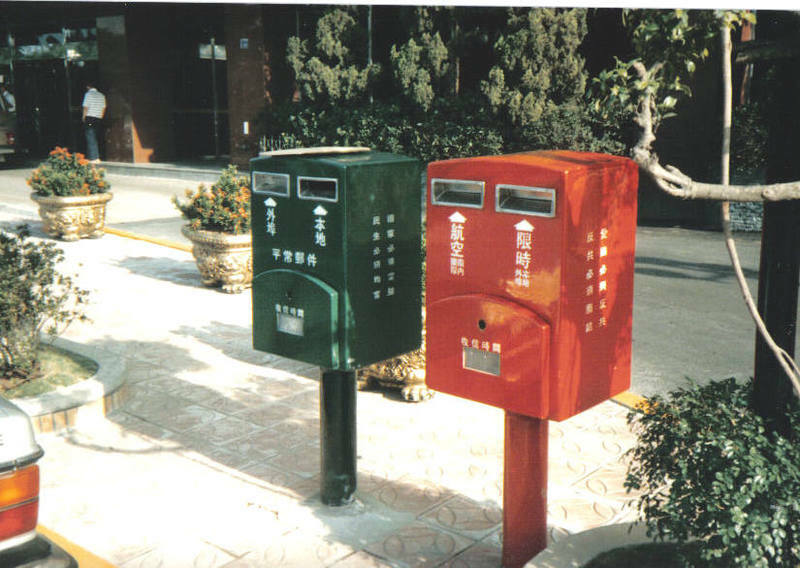 It is simply two mailboxes in a Taipei street, and there was something about the two of them that demanded being recorded. I have no idea what the writing on them says, but to me the sight of the two of them was rather pleasing.